Check out this brief bio and scroll down to get to know more about me. Andrew is a master of tasteful guitar regardless of the style of music. Martin Taylor says Andrew has a 'great tone, brilliant musical ideas and nice touch on guitar'. Others acclaim his compositions and custom songs. Since 1989 Andrew has performed locally and internationally in a wide variety of music genres and venues. During this time he has honed his composing, arranging, programming and playing skills. 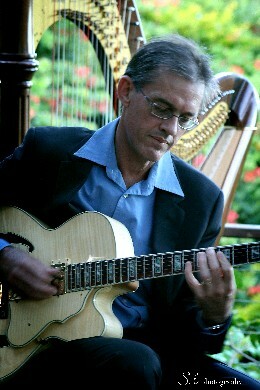 He also has considerable experience in solo guitar performance and has a broad repertoire. Contact me for gig bookings or House Concerts. Since 1994 Andrew has been a freelance guitarist working with and supporting many well known Australian and international artists including Petula Clark, The Platters, Graham Connors, Grace Knight, Marcia Hines, Anthony Warlow, Tina Arena, Rick Price, Julie Anthony, The Ten Tenors, Geoff Harvey, Venetta Fields, Doug Parkinson, Tommy Emmanuel, Don Burrows and James Morrison. His easy going manner, great playing and professionalism have made him a popular choice for acts on The Gold Coast and elsewhere. The 2011 Brisbane season of the hit musical ‘WICKED’ saw Andrew take on the task of guitars, mandolin and banjo. He has also been in the pit orchestra for the Brisbane season of Mary Poppins, Annie and A Chorus Line and a number of musicals including the locally produced ‘Pyjamas in Paradise’, ‘Fame’, ‘Les Miserables’, 'Thoroughly Modern Millie' and ‘Jesus Christ Superstar’. 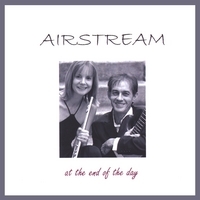 In 2007 he recorded 'At the End of the Day' with flautist Joanna Sullivan under the name Airstream. This album features beautiful classical pieces and originals and is perfect music for winding down and relaxing. We would love to play for your wedding ceremony so contact me via email. Our album is available here. My guitar tracks are available here. Download a short bio here. Join the online community for updates, concerts, giveaways and performances!